Some of the worst damage to trees occurs during construction of a new home or building. Obvious signs of damage are equipment cutting or rubbing against the tree and broken branches and cuts in the bark. These problems deplete the plants of energy. If branches are broken and foliage is reduced it offers less photosynthesis to the tree and when the bark is cut the tree focuses its energy on repairing itself instead of growth. Cuts in the tree’s bark also leaves it open to insect infestation and disease. However, the worst type of damage done to trees during construction is below the ground to the root system. The most vital part of a tree is the roots. It anchors the tree in the ground and also supplies nutrients to the tree. Approximately 90-95% of trees roots are in the top 3 feet of soil, spreading out sometimes father than the reach of the branches. How to protect your trees. When doing any kind of construction on your property, hire a professional with insurance coverage for property damage, personal liability, and workers compensation. Hire a professional Certified Arborist to inspect your trees before any construction begins, they can help determine which trees to save and which to remove. Your arborist can help you determine a Protected Root Zone (PRZ) for your trees. Alert your builder of the PRZ’s and make a plan to avoid these areas, draw a map of your property to show clearly where the protected areas are located. Erect tree save barriers around the PRZ to act as a visual and physical marker. Silt fences might be needed to avoid runoff from materials used in construction. Avoid all traffic in the PRZ, this includes equipment, like bobcats, as well as foot traffic. Never store materials in this area, it can cause soil compaction which damages the roots of your tree. Most importantly, never grade soil in the PRZ, this could cut into the roots of your tree making it less stable and possibly compacting the soil above the roots. Grading near the PRZ can also change the direction of water run-off decreasing the amount of water supplied to the tree. The best way to ensure the safety of your trees is to be present during construction, check in to make sure your protection plan is being followed and keep an eye out for any signs of damage to the tree. Look for dead or dying branches that may need to be pruned after construction has ended. When your construction is completed, schedule an appointment with your Certified Arborist to inspect your trees for damage and to schedule any care or treatment that may be needed. 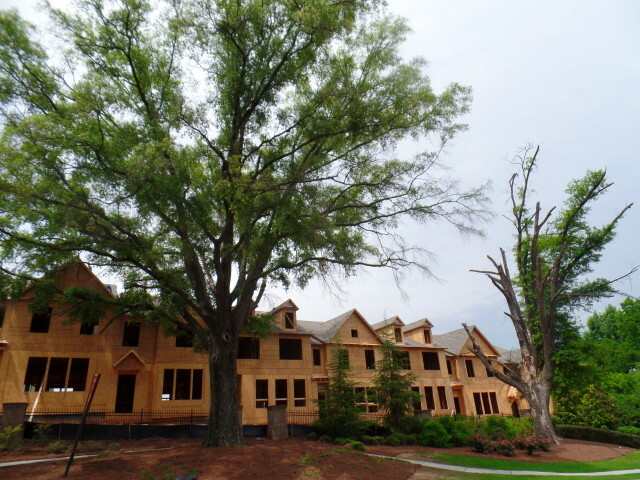 Heath Tree Service loves the old-growth trees in Atlanta, let us help protect yours!